Jim Provance at The (Toledo) Blade is reporting that the state director of the Obama administration's reelection effort in Ohio, Greg Schultz, is mobilizing supporters against the recently passed changes to the Buckeye state's election law. Ohio Democrats' initial efforts to put the issue of the elections changes on the ballot were rebuffed due to inaccuracies in the petition they submitted. Their do-over simplified the petition seeking to overturn not parts of the new law but instead the law in its entirety. That includes the portion of the legislation that shifted the Ohio primary from the first Tuesday after the first Monday in March to the first Tuesday after the first Monday in May. This is all very interesting because their are competing strategic interests involved here. 1. The Obama administration -- or at least the president's reelection campaign -- is concerned that the new restrictions on early and absentee voting will disproportionately impact Obama voters in the general election. 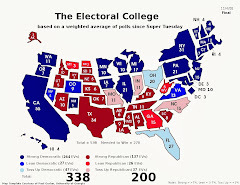 And in a swing state like Ohio in an election that looks to be -- from our view of things at the end of August 2011 -- close, every vote counts. 2. However, the Obama folks are playing with fire here to some extent as well. Many are talking about how the Republican nomination race could stretch into May or June (or to a brokered convention), but that is not a certainty at this point in time. If Romney or Perry can wrap up the nomination earlier than that May to June window -- say toward the end of April when a host of northeastern states will hold a regional primary -- an Ohio primary back in March puts the state into the window of decisiveness. That also potentially puts Ohio into a competitive campaign environment in which Perry and Romney energize and mobilize a great many Republican voters who are apt to stick with the party in the general election. The Democratic nomination race from 2008 is a perfect example of this. 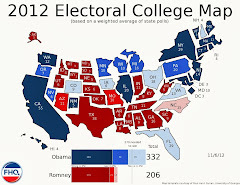 The battle for the right to be the Democratic nominee impacted registration efforts in suddenly relevant states like North Carolina and Indiana -- two typically red states that Obama later carried in the general election by narrow margins. Now this could happen to Ohio in 2012 whether the primary is in March or May, but it is more likely within the window of decisiveness in March as opposed to May. 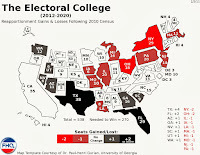 Now, the flip side of this is that a protracted or semi-protracted Republican nomination race will veer off into Carter-Kennedy territory as opposed to a repeat of the Obama-Clinton race. If Perry vs. Romney turns, to borrow a word from the Texas governor, ugly, that divisiveness could impact the party's chances in the general election. That angle is not getting much play in the political press at the moment, but it represents a very fine line in any evenly-matched or competitive nomination race: When does the balance tip from positive energy within the Republican electorate to discontent among two Republican camps? We are an eternity away from gathering an answer to that question, but it is worth throwing out there as this nomination race continues to develop. The Obama campaign appears to be signaling that the potential problems in the general election from supporters lacking a certain ease of voting is a greater problem than the unknown of what the Republican nomination process may produce -- whether in terms of a candidate or a unified/divided Republican Party. On a morning where we sit on the cusp of the beginning of September -- a month that will likely be very busy in terms of finalizing the 2012 presidential primary calendar -- FHQ wanted to follow up both on yesterday's Arizona post and a couple of tweets I sent out late last night. The tweets were in response to an ABC News item by Amy Bingham that largely gets the situation right.1 Ms. Bingham picks up on the contours of the situation in Arizona: highlighting the fact that January 31 may not be the only option Governor Brewer is considering as a landing place for the Grand Canyon state's 2012 presidential primary. What is misleading about the article to some extent -- it is more about the headline -- is that is mischaracterizes the situation surrounding the decision-making calculus in Arizona right now. FHQ doesn't shy away from arguments of semantics and that's really what this is. That said, it is important frame this story in the proper context. Governor Brewer may in fact opt to schedule the presidential primary in Arizona for some time between January 31 and February 28, but I don't think the possibility of her opting for something later than January 31 should be described as "backing down". That implies that the governor is reconsidering because of some outside stimulus. The clearest implication is that she is "backing down" based on the delegate selection rules -- or more to the point the penalties -- the RNC has put together for the 2012 cycle. Granted, the ABC News piece only puts out there the idea that Brewer is wavering without answering the question of why. It could be the rules, though time and again, Brewer and her spokesperson have repeated the "we don't care about the delegate penalties" refrain. It could be negotiations with the RNC over how to resolve the issue have brought the governor to the conclusion that there is a compromise position. Again, FHQ doubts this based on the fact that Arizona loses leverage with the party -- in terms of potentially reducing the delegate penalty -- the more she keeps the RNC and everyone else in the dark on the decision-making process. It could also be that the governor, independent of pressure from anyone outside of Arizona, has come to the conclusion that she can maximize the attention -- from the candidates and the media -- to the Arizona primary just as well on, say, February 14, as she can on January 31. Again, consistent with the negotiations language, one leads with an outlandish offer only to "bargain" one's way to a perceived less threatening, yet ideal position. FHQ, without getting too Safire-esque, is not of the opinion that Brewer or anyone is backing down to anyone or anything. Our response: Backing down from/to what? There is no clear indication as to what that answer may be. All we know is that Brewer's spokesperson broke from a very consistent "she's leaning toward January 31" message and has allowed for the possibility that other options are on the table. ...and they are most likely on the table because Brewer can get Arizona what she and other Arizona Republicans think the state deserves in all of this: a greater portion of the attention pie. Regardless, what I have heard through the grapevine is that Brewer will, regardless of the ultimate date, make a decision this week. 1 Of course, that may be because someone at ABC News was hanging around FHQ yesterday prior to posting a story that echoes to a great degree the points made in this space yesterday. At least now I know that the Disney IP address out of New York is associated with ABC News. If you have read the news out of or surrounding Arizona over the last week or so,1 then there seems to be one take home message from all the stories: Governor Jan Brewer is running out of time to move the Grand Canyon state's presidential primary to January 31 if that is her preferred date. And according to the extremely consistent statements from her spokesperson, Matt Benson, "the governor continues to lean toward January 31". Any of the periodic updates that have emerged in the time since Governor Brewer raised the possibility of moving the already non-compliant Arizona primary -- something that has still not been dealt with either by the press or the RNC -- have said the same thing. "The governor has indicated her priority here is to give the biggest platform to Arizona voters and Southwestern issues," he said. "You could potentially see a potential presidential preference election date other than Jan. 31 and accomplish the same thing." As FHQ mentioned back in late July, Arizona was/is forcing the RNC to the negotiating table. The January 31 move was an opening offer. And we're beginning to see evidence of that in Benson's admission that the state can likely carve out an attention-maximizing position on the calendar on a date other than (read: later than) January 31. Now, that isn't to suggest that Brewer will not ultimately decide to move the Arizona presidential primary to January 31 on or before this coming Friday or Saturday. However, FHQ will go to great lengths to urge folks to consider that there are other options on the table. Brewer moves the Arizona presidential primary to January 31. That forces a reaction from Florida. And that triggers a response from Iowa, New Hampshire, Nevada and South Carolina. The outcome is that the process gets pushed up into the front half of January (or earlier depending on how particular other states are about the space between contests). Brewer moves the primary to a date other than January 31 some time this week. Again, Arizona will likely have much of February to itself. Missouri and New Jersey are going to move from February 7 barring something unforeseen and Wisconsin has active, Republican-sponsored legislation to move its primary to April 3. That leaves February 7, February 14 and February 21 as possible dates that are earlier than the February 28 position Arizona now currently occupies. Much of this calculus on Arizona's (and other states') parts is going to depend on how much space they desire between their primaries and others. Finding a week to itself would prove more difficult and force Arizona to January 31. But if the goal to to get Arizona a stand-alone date with a half of a week buffer between it and other contests, then one of the February dates is likely workable. Brewer lets Friday/Saturday come and go without an announcement. That signals that she has set her sights on a later date. FHQ isn't particularly high on this option simply because Brewer loses some potential leverage in the process. The threat becomes less severe if the governor lets the decision stretch beyond this week. By the same token, that could also win her some points with the RNC; by reducing the threat. That keeps things within the negotiations narrative. I don't know that I have a gut feeling one way or the other. However, I do want to highlight the read-between-the-lines quote from Brewer's spokesperson. There are other options on the table; despite the leaning towards January 31 talk. What else would you expect a state bargaining for a piece of the early presidential primary calendar pie to say? Of course they are leaning toward January 31. That's the biggest threat and that would net them the largest potential concession -- a prime spot on the calendar -- from the RNC. 1 It is funny that a seemingly innocent Arizona/Brewer reply tweet to Andy Barr last week prompted Emily Schultheis at Politico to follow FHQ on Twitter and in turn begat an Arizona story which begat First Read's Calendar Chaos story which begat the most recent AP account. I'm just glad folks are paying attention to the Arizona situation. The Wyoming Republican Party Central Committee voted Saturday to hold the party's presidential delegate selection starting on "Super Tuesday," March 6, said State GOP Chairwoman Tammy Hooper. However, some rural counties might not hold a vote until as late as March 10 because it would be hard for delegates in those areas to meet on a weeknight, she said. "That's in calving season," Hooper said. During caucus elections, held during county conventions, precinct delegates in each county will vote on delegates to the Republican National Convention in Tampa, Fla. Each county will elect either an RNC delegate or an alternate -- except for Laramie County, which gets to choose one of each. Twelve of Wyoming's 29 RNC delegates will be elected by the counties; the rest will include Gov. Matt Mead, Hooper, the state's two national committeepeople, and at-large delegates elected at the state GOP convention April 12-14 in Cheyenne. Republicans will also hold a non-binding presidential straw poll during precinct caucuses, which will be held between 10-25 days before the county convention, Hooper said. Hooper said the state GOP's central committee chose March 6 because Colorado Republicans are caucusing on the same day. "We wanted to try to capitalize on the fact that Colorado's going to probably be a somewhat battleground state, and we're trying to capitalize on their energy," Hooper said. Colorado is not the only Wyoming neighbor potentially with caucuses on that date. Idaho Republicans have also recently opted to hold Super Tuesday caucuses in lieu of a May primary. In fact, Colorado may not ultimately end up March 6. Colorado Republicans have expressed some interest in moving caucuses up to February 7; a date to which they can move under Colorado law. From the look of the plan outlined above, Wyoming Republicans are actually starting their delegate selection process 10-25 days before the start of the March 6 county conventions -- in a February 10-25 window -- during which a non-binding straw poll will be held. The delegates will then be allocated in both the county conventions (county district delegates) and the state convention (automatic and at-large delegates). 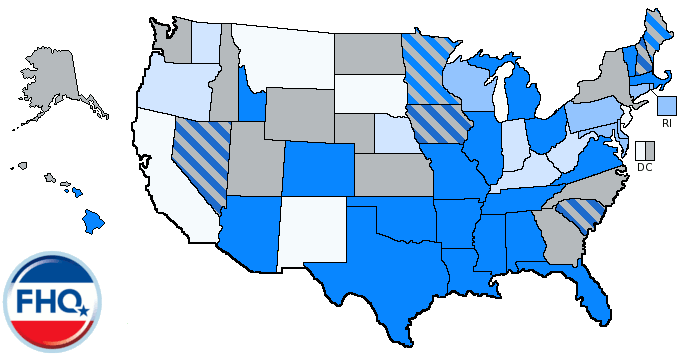 An update of the 2012 presidential primary calendar can be found here. Jim Galloway at the Atlanta Journal Constitution (via Secretary of State Brian Kemp's office) is reporting that a series of new elections laws passed by the Georgia General Assembly this past session have been precleared by the Justice Department (in accordance with the Section V of the Voting Rights Act). On the list of laws reaching preclearance was the bill that shifted the presidential primary date setting authority from the legislature to the secretary of state. That allows the Peach state more leeway in setting its date than in the past when a decision had to be made before the legislature adjourned in late April/early May. The secretary of state can now assess the lay of the land with other states on the primary calendar before having to set a date before December 1 in the year preceding a presidential election. This is the same method -- sans the requirement that a decision be made by a particular date -- that New Hampshire has used to stay at the front of the queue since 1976. As long as the change in no way affected minority voting rights -- and there is no evidence that it does -- then the plan was always going to be okayed by the federal government. Atlanta – Georgia Secretary of State Brian Kemp announced today that his agency’s 2011 legislation affecting election processes have received approval or “preclearance” from the U.S. Department of Justice (DOJ). Each bill was passed during the 2011 session of the Georgia General Assembly and signed into law by Governor Nathan Deal. Under federal law, Georgia must obtain federal preclearance of any change affecting voting by filing suit in federal court or by obtaining administrative preclearance through the DOJ. HB 92 provides a uniform starting date for Georgia elections by reducing the in-person early voting period to the three weeks prior to Election Day. Reducing the in-person early voting period will free up critically needed resources in Georgia counties, and does not affect a voter’s option or ability to cast a mail-in absentee ballot 45 days prior to Election Day. Historically, approximately eighty percent of early voters cast their ballot during the three weeks prior to Election Day. HB 158 can prevent adding an extra election date in the event of a run-off, and the associated costs to Georgia’s counties. HB 302 allows the state to meet federal UOCAVA requirements for our military and overseas voters. HB 454 gives the state more options and flexibility to determine when it will hold its presidential preference primary, and will ensure that the voices of Georgia’s voters are heard and are relevant in the presidential candidate nomination process. The Secretary of State must set the date no later than December 1 in the year prior to the primary, and the date must be no later than the second Tuesday in June of the primary year. Further, there must be a period of at least 60 days between the day when the Secretary of State sets the date and the date of the primary. Brian Kemp has been Secretary of State since January, 2010. Among the office’s wide-ranging responsibilities, the Secretary of State is charged with conducting efficient and secure elections, the registration of corporations, and the regulation of securities and professional license holders. The office also oversees the Georgia Archives. The Wyoming Republican State Central Committee met in Casper on Saturday for their summer meeting and the timing of the state party's caucuses was on the agenda. Recall that the Wyoming GOP chose to challenge the national party rules in 2008, and there was an open discussion during the committee's spring meeting over whether to repeat the early 2008 caucuses or stick with the new national party rules in 2012. Very little news has come out of the meeting yesterday -- at least in terms of the date of the caucuses. However, the broad message that has emerged -- from Wyoming Republican consultant Bill Novotny via Twitter -- is that the committee decided not to take on the national party by choosing to begin their delegate selection process in March. Again, that is the general take home from the meeting, but as of now the specifics regarding the actual date are still absent. Given the minutes from the Wyoming Republican State Central Committee meeting in April, it appears as if the two alternatives were 1) hold earlier than allowed caucus meetings or 2) hold those caucuses on the second Tuesday in March. In this case, the second option was given the green light. There is nothing in the Wyoming Republican Bylaws (2010) that in any way codifies a second Tuesday in March date as the usual date on which the party holds caucuses -- presidential or otherwise. Beyond that, the statement from the minutes of the April state central committee meeting that mentions that particular March date does not specify whether that is a potential caucus day or just a barrier before which the caucuses should/must be held. For the time being, then, FHQ will reshade Wyoming on our 2012 presidential primary calendar map, but leave the date unspecified until the actual date can be verified. The Oregon legislature adjourned for the year -- with the exception of a few meetings here and there -- back on June 30. One bill that was left in committee upon adjournment was the bill introduced way back in January to move the Beaver state primaries from May to June.1 FHQ discussed in detail the ramifications of the move in March around the time that the House Committee on Rules held a hearing to consider the bill. But that hearing was the last that was ever heard of this bill. It was stuck in the rules committee and remained so through the adjournment of the legislature at the end of June. Indeed, support for the bill was mixed at best when it was discussed at length in the legislative committee hearing. As such, FHQ is making the executive decision to move Oregon out of the "active" bills to move presidential primaries category and solidly onto the May 15 date for its primary next year. There is nothing FHQ could find in the guidelines of the Oregon legislative process to indicate that bills officially die in committee upon adjournment. However, the Oregon Department of Energy report on energy-related bills introduced and considered during the 2011 session counts bills left in committee as failed bills. That slight evidence plus the fact that the bill never really garnered much support in the first place is the reason for the shift. Similar arguments could be made about the legislation to move the presidential primaries in both Massachusetts and North Carolina. But those cases are slightly different. Massachusetts has a year-round session, so the legislation there -- though there is little evidence to suggest that a move to June is imminent much less supported -- is still alive. And Massachusetts did not move its primary to February 2008 until late in the year in 2007. In North Carolina, the session has adjourned, but there is at least some talk about the legislature considering elections-related legislation in its September 12 session date. That does not, however, include S440 to FHQ's knowledge. Oregon, then, will be shifted, but North Carolina and Massachusetts will remain technically, though not probably in reality, active. 1 The state of Oregon holds its presidential primary and the primaries for state and local offices in presidential election years on the third Tuesday in May. Notes: Check out FHQ's primer on when the remaining states will likely decide on dates. Download FHQ's calendar for iCal or Outlook or see it on Google Calendar. Short story, potentially big message. This will be the first year Kemp will set the presidential primary date, after the General Assembly passed the measure this spring for him to do so. Yet, with New Hampshire and Iowa attempting to remain the first primaries of the season, dates have fluctuated. Kemp said he is waiting for those dates before putting Georgia in the mix. The Iowa and New Hampshire caucuses historically have set the pulse of the presidential elections. Kemp has been mostly tight-lipped on the issue of the Peach state presidential primary since the Georgia General Assembly ceded its power to set the date to the secretary in legislation signed into law earlier this year. The point of the bill was to allow the state -- through the secretary of state -- the flexibility it did not have previously in setting the date of its nominating contest. There have been clues from Kemp in the time since, but not much in the way of firm specifics. Of course there have been a couple of hints about coupling the Georgia primary with the Florida primary. What has been missing to this point, however, is any indication of Kemp's the or the Georgia Republican Party's willingness to defy the RNC delegate selection rules. The true issue isn't so much whether Georgia will defy the rules. It is more about the extent to which the state will defy the rules. First of all, good luck waiting out Iowa and New Hampshire. The two states at the head of the queue have a better chance of holding a primary before Kemp makes a decision than Georgia actually threatening those privileged positions. I only say that partially in jest. What Kemp is demonstrating here is not necessarily a threat to Iowa and New Hampshire. Instead, the secretary appears to be demonstrating at the very least a willingness to utilize every last day until the December 1 deadline by which that the newly enacted legislation requires him to set a date for the primary. If Secretary Kemp waits that long he will soon begin to limit himself. A December 1 decision only allows the secretary to set a date for January 31 at the earliest. A decision made sometime during November would theoretically put more of the month of January into play. The way FHQ sees it, though, the secretary won't have to wait until December 1 to wait out the states other than Iowa, New Hampshire, Nevada and South Carolina. For the most part, those states should fall in line during or around the first part of October (if not by the October 1 RNC deadline). The state Senate on its only August session day wasted little time in addressing the presidential primary date. Introduced today, SB 584 would create a committee comprised of three members -- one each chosen by the governor, speaker of the state House and leader of the state Senate.2 The committee would be charged with setting a date -- following the Michigan Republican Party's guidelines -- between February 28 and March 6. The primary is currently scheduled for the February 28 according to state law. The committee could opt to maintain that date or shift it to something slightly later. Regardless, the committee would be required to make a decision on or before October 1. Technically, the legislature will be in session during September and into October and could set the date, but may not be able to act as quickly as the appointed committee would be able to, depending on the dynamics of the primary calendar at that time. Hat tip to the AP for the news. 1 The provision only creates the panel for the purposes of setting the 2012 primary date. 2 All three -- Governor Rick Snyder, Speaker Jase Bolger and Leader Randy Richardville -- are Republicans. Will lightning strike NC again in presidential race? Ugh. Not This Skipping Iowa Thing Again!? !